Censored by the U.S. Army, Dorothea Lange's unseen photographs are the extraordinary photographic record of the Japanese American internment saga. This indelible work of visual and social history confirms Dorothea Lange's stature as one of the twentieth century's greatest American photographers. Presenting 119 images originally censored by the U.S. Army—the majority of which have never been published—Impounded evokes the horror of a community uprooted in the early 1940s and the stark reality of the internment camps. 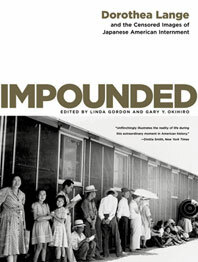 With poignancy and sage insight, nationally known historians Linda Gordon and Gary Okihiro illuminate the saga of Japanese American internment: from life before Executive Order 9066 to the abrupt roundups and the marginal existence in the bleak, sandswept camps. In the tradition of Roman Vishniac's A Vanished World, Impounded, with the immediacy of its photographs, tells the story of the thousands of lives unalterably shattered by racial hatred brought on by the passions of war. A San Francisco Chronicle Best Book of 2006.